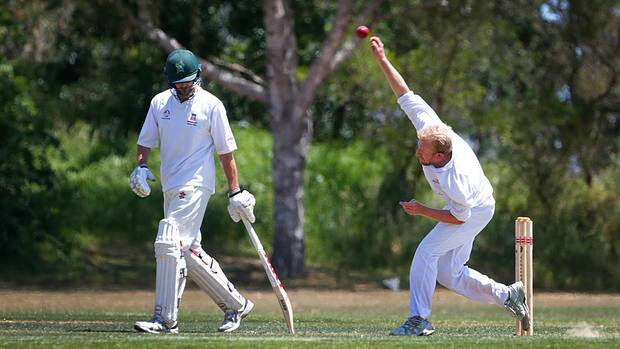 WHS old boy Ross Kinnerley took five wickets in the space of nine overs yesterday for Wanganui to bowl out Taranaki for first innings points in the Furlong Cup. Did somebody say something about playing well on Furlong Cup Sundays? An excellent recovery session by the Air Chathams Wanganui lower order on Saturday and then a fantastic two hour spell of bowling this afternoon saw the predominantly young side secure first innings points over a stunned Taranaki at Pukekura Park. The sensational batting collapse after play was delayed until 1.30pm following a spell of rain saw Taranaki lose eight wickets for just 51 runs to finish only five runs short of Wanganui's first innings total of 218 all out. Having returned from a festive winter holiday with his family in England, Ross Kinnerley (6-39) was sensational, taking out Taranaki's middle order to the tune of three wickets in one over, while Connor O'Leary (2-36) was very much redeemed after an undisciplined first day of bowling where he was removed from the attack following 10 no balls from a misplanted foot. 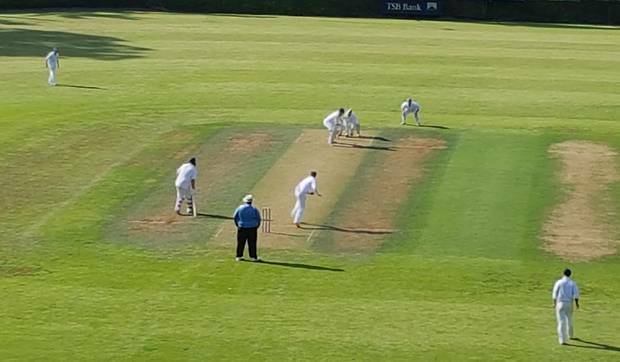 Wanganui's batting heroes on Saturday were the stoic defence of veteran Dominic Rayner (45) and Matt Simes (22), being stone wall for a combined 229 balls after their team was struggling at 55-4, and then John McIlraith (29) and Chris Sharrock (61 not out) going on the attack in the post-lunch session. Sharrock, despite a lack of club cricket due to badminton commitments, raised his second unbeaten half century in as many Furlong innings, and made several visitors to Pukekura Park change from nature lovers to cricket spectators as he hit six fours and three sixes against the Taranaki spinners. Taranaki captain Mattie Thomas (7-59) kept himself on for 13 overs more than any of his other bowlers, but it worked as he eventually managed to catch out McIlraith and then ran Sharrock out of partners, but not before the batsman got a defendable total on the board. Wanganui made a great start to their bowling with Kinnerley getting his first wicket in the opening over and Akhil Kumar (2-48) likewise being a livewire, but O'Leary's extras helped Josh Borrell (82) and Shaun Sullivan (58) to play themselves in while the scoreboard kept ticking over, each of them ultimately hitting eight boundaries on Saturday. Despite both teams using their spinners for a quick over rate, with Sharrock very unlucky to have both the Taranaki batsmen dropped off his bowling, Wanganui were required to carry on right through to 6.30pm and Taranaki seemed on their way to a declaration somewhere north of 300, sitting on 162-2 at the close of play. Wanganui's Chris Sharrock bowling to Taranaki's top scorer Josh Borrell on a picturesque Saturday at Pukekura Park. The visitors could be encouraged, however, with the batting fightback to raise their largest first innings total this summer, as McIlraith and Sharrock effectively countered fiery pace bowler Ryan Watson, who went wicketless, although he did managed to bounce one lifting delivery off McIlraith's helmet. Sam Sherriff, Akash Gill, Dominic Lock and Kinnerley had all been dismissed cheaply, with Gill just playing as a batsman, while the veteran Rayner's achilles began to bother him as the longer his 146-ball innings went on. But by the time Simes went, Taranaki had been fielding a long time and Thomas along with fellow spinner Michael Blanks tried to trap McIlraith and Sharrock into giving up catches near the rope, but McIlraith would just chip the inner circle for two's, while Sharrock drove straight to the reach shorter boundary at the other end, while also landing some more wild sweeps just away from the fielders. Thomas eventually got McIlraith, but Sharrock brought up his 50 with successive sixes off Blanks to take his team to 196-8, with Hadleigh O'Leary (12) staying with him for what proved a crucial 30-run partnership. But then O'Leary copped some punishment when bowling after skipper Lock had to give Kinnerley a rest and also replace the wayward Connor O'Leary, despite getting opener Bailey Wisnewski caught on the boundary, while Gill was not a bowling option. Yet it all clicked for Wanganui's attack straight from the 1.30pm restart, as a fired up Kinnerley had Sullivan out to a good Hadleigh O'Leary catch in the second over, and then Kumar stepped up four balls later to get a nick off Borrell to expose Taranaki's underbelly. Without Dean Robinson (family commitment) and Kaylum Boshier (Chiefs rugby contract, played the T20 Black Clash on Friday), Taranaki fell apart as Philip Barraclough gave up another nick off Kinnerley, who found a second wind. In his fifth over, Kinnerley had previous Wanganui tormentors Thomas and Watson dismissed in consecutive balls, and although Davis Mills survived the hatrick delivery, he offered up yet another nick to wicketkeeper Simes, making up for his miss the day before, to have Wanganui in sight of the unthinkable at 183-8. Surviving batsman Liam Muggeridge watched all this from the other end, but with Kinnerley needing a breather, the O'Leary's stepped up as Connor had Muggeridge caught behind as he and Hadleigh began bowling maiden overs at 191-9. Yet Taranaki still nearly pulled it out as Ben Frewin (25 not out) had survived 30 deliveries to raise six runs, trying to protect last man Blanks with singles, while Blanks would keep out 23 balls for a solitary run. Frewin then began to counterattack, striking three boundaries as Wanganui swiftly brought Kinnerley and Kumar back, only for the scoreboard to jump from 195 to 212 in the space of four overs. Then Frewin took a leg bye with two balls left in the 69th over for Kumar to have what could have been Wanganui's last throw of the dice, and the young Canadian-Indian delivered – shattering Blanks stumps with the second ball. Wanganui manager Andrew Lock knew his team was still in a fight for survival with 52 overs left in the day to try and bat out or get far enough ahead that Taranaki would not have time to slog their way to the out right win. At the 4.30pm dinner break, Wanganui were on 29-2 as Sherriff fell to Watson and Rayner was caught out by Mills, both for nine, with Kumar and Dominic Lock preparing to come back to face the start of the last 40 overs. 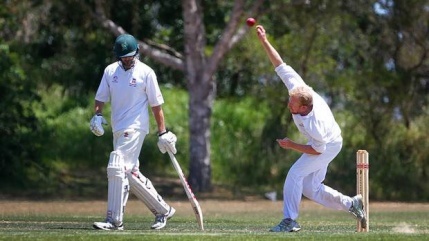 "Just a good bit of bowling," Andrew Lock said of the stunning fightback. "The pitch probably damped up a bit this morning. "Ross was fantastic, and Connor came back from that disastrous no ball effort and bowled extremely well. Akhil was solid again, got two for nine today." "Wow, there it was. I can't remember the last time we've done that [to Taranaki]. "Everything that went to hand stuck." Lock laughed that the squad had taken note of being called a good "Sunday" team in the Whanganui Chronicle, and as the wickets fell at Pukekura Park, the fielders were actually yelling it out to each other. Bowling: R Watson 13 overs, 2 maidens, 51 runs, 0 wickets; E Keller 9-3-18-1; B Frewin 9-2-22-1; M Thomas 26-9-59-7; D Mills 10-4-19-1; M Blanks 9-2-36-0. Bowling: R Kinnerley 21-5-39-6; C O'Leary 10-4-36-2; A Kumar 14-2-48-2; H O'Leary 6-1-27-0; J Clark 6-0-19-0; C Sharrock 12-2-31-0.